Today you have a look I made playing around with two of the colours that came in the Julep Gem Collection: Echo and Jasmine! I don't know what's up these days, but I can't seem to sit down and make a "normal" looking mani design these days... Everything is tacky and glittery and wonderful. 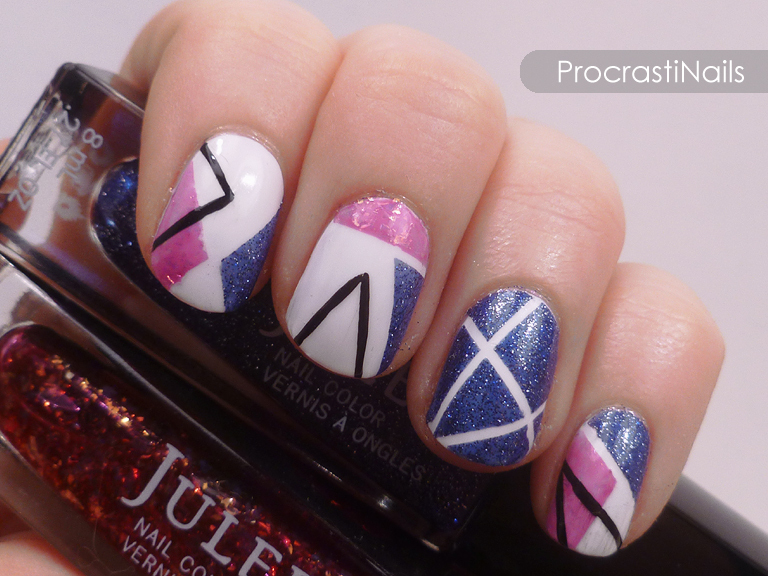 I actually made a design the other day that I labelled "The Tackiest Mani In The World. Legit." Maybe it will see the light of day eventually, maybe not. This whole thing started off with a base of Essie Blanc, and when that dried I used some tape to block off sections for most of my nails, and made a laser pattern for full coverage on my accent nail. 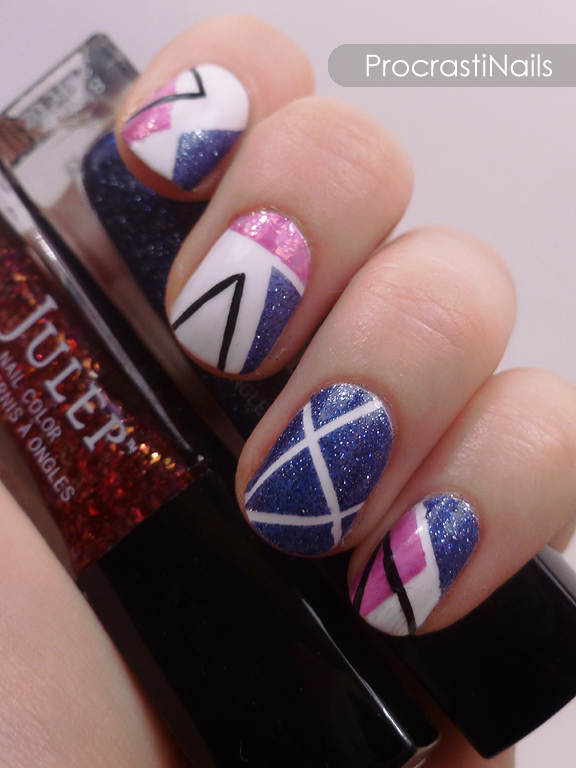 The lovely purple/blue shade is Julep Jasmine, and the pink is Julep Echo. Echo didn't turn out AT ALL like what I expected, but that's probably because the base was white. 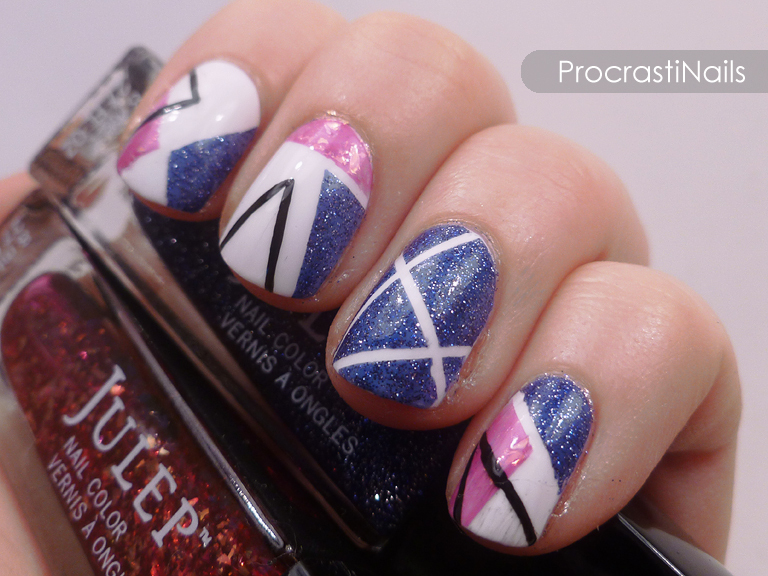 (We'll see what it looks like without undies in my upcoming Gem Collection swatches!) The black lines were then free-handed with Quo by ORLY Instant Artist in Black. Beautiful!!! And I love your blog! !